"Bangers and mash gets its name because sausages used to burst (or bang) while cooking, due to rusk (dried bread) being added to the meat. Mash, meanwhile, refers to the mashed potatoes. This recipe was a staple at our home in Dublin at Halloween. 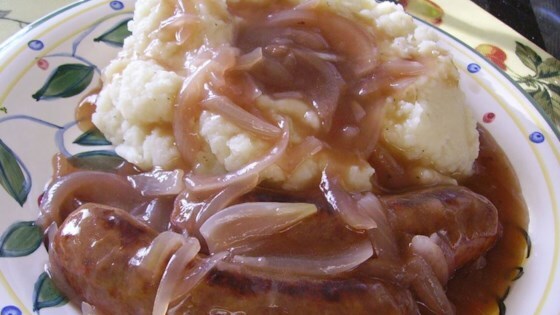 It is a very cheap, very traditional supper, and one that truly requires good sausage. Try to use a good quality sausage or perhaps even a bratwurst. Please note that this is a very thin gravy, as is traditional. It will still be very liquidy."